Mitsubishi FUSO, the Daimler owned Japan based company that constitutes the competitive landscape of heavy duty trucks market has recently unveiled an absolutely state-of-the-art electric heavy-duty truck concept at the Tokyo Motor Show. As per the prototype that was being revealed by the automaker at the Motor Show, the Class 8 concept truck, weighing almost 51,150 pounds would be able to drive 220 miles on a single time charge. Experts have been already raving about the concept, so dubbed as E-FUSO Vision One, claiming it to be disruptive for the entire heavy duty trucks industry trends. As per analysts’ opinions, the onboard of this product would position Daimler in direct power battle with Tesla, as the latter is planning to launch its flagship electric semitrailer on November 16, this year. While it is still to be seen whether Mitsubishi FUSO’s electric heavy-duty truck outpaces Tesla’s semitrailer, the Japanese conglomerate is undoubtedly considered one of the pioneers in heavy duty trucks industry. Some of the other biggies involved in heavy duty truck market include Toyota, Ford Motor Company, Tata Motors, Volkswagen, FAW Group, and Navistar. Speaking of competitive profiling, it is important to note that technological interferences in the vehicle design is claimed to be the one of the most lucrative growth strategies adopted by heavy duty trucks market players. In order to ensure extended consumer base and geographical reach, these automakers have been increasingly incorporating advanced features such as telematics services, autonomous driving in the vehicle design. Heavy duty trucks market has been witnessing an inflection point, since for a while now. High Fuel consumption, rapid uptake of advanced technologies, environmental indexes, and fast market turnovers are some of the few rationalities that underline the commercialization matrix of heavy duty truck industry. The commercialization potential of the overall market can be justified from the estimates that claim heavy duty truck industry to have garnered over USD 110 billion in 2016. On that note it would be prudent to mention that road and rail freight transport that procures a lion’s share of the overall freight activity has played a pivotal role in enhancing the industry share. Statistics depict, heavy duty trucks almost account for almost 65% of the road freight activities, which is a clear indication of the escalating product demand in this domain. While exploiting ample opportunities from road freight transport sector, heavy duty trucks industry players are equally focused toward environmental impacts caused by the use of these vehicles. As per a recent report put forth by IEA (International Energy Agency) - oil demand for road freight vehicles will rise by 5 million barrels/day by 2050. What makes it more alarming for the heavy duty truck market players is the parallel impact of oil consumption on carbon dioxide emission from vehicles, which would reach almost 900 million tonnes by 2050, claims IEA. It has been further mentioned in the report, that APAC belt, especially China and India would account for 90% of the total increase in road freight oil demand by 2050. Improving the energy efficiency of road freight transport has thus become crucially important to maintain the ecological balance with regards to oil demand, CO2 emission, and air pollution, the fundamental aspect that has triggered a paradigm shift in heavy duty trucks market trends. Speaking of consequential transformation, a strict regulatory framework speaks volume and has contributed immensely in outlining the overall heavy duty trucks market dynamics. This is quite vivid from the increasing initiatives that are continuously being undertaken by international entities to curb GHG emissions from road freight transport. For instance, in August 2011, EPA in collaboration with NHSTA issued fuel economy and GHG emission standards that medium and heavy-duty truck manufacturers need to comply with for the model period 2014-2018. As per the estimation, this combined standardization would reduce carbon dioxide emissions by almost 270 million metric tons, allowing a saving of almost 530 million barrels of oil over the entire lifecycle of the vehicle for the period 2014-2018. For heavy duty trucks market players, this is a vital consideration to cut down carbon pollution from the vehicles. Technological interference in the vehicle design along with shifting trend toward energy efficient trucks is deemed to be a positive indicator for heavy duty trucks industry growth. However, economic uncertainties across European countries along with fluctuations in raw materials price trends is somewhat having a deterring influence on the market infrastructure. Nonetheless, leading giants have been increasingly investing in research activities to come up with cost-effective solutions. 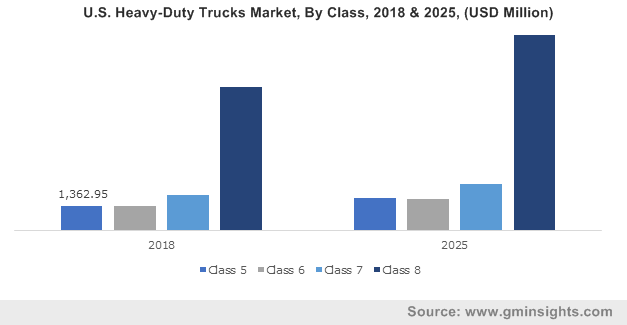 Driven by the extensive product penetration across mining, construction, agriculture, and logistics sector, heavy duty trucks industry is forecast to record a valuation of USD 160 billion by 2024.